The Great Norn Breeding Race: Abort Experiment! The original experiment has had to be aborted. Today my copy of creatures 3 arrived today. Installing it on a 64 bit copy is a huge PAIN!!! It took me a good 6 hours of messing with compatibility settings to no avail. Eventually I managed to get the game installed by restarting and trying in safe mode. Worked first time no problem. After updating (a reinstall of docking station due to my fiddling) I was on my way. Unfortunately when I reinstalled my breed packs I think the order I installed them in muddled all the previous data for my exported norns. When I reimported the male norn survivors their body parts were the wrong skins. So I’m having to restart the experiment. A single norn egg is laid for each breed. 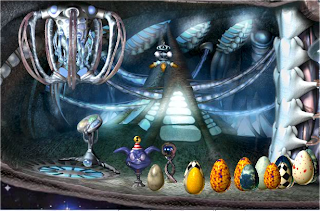 The eggs are all placed in the workshop and the order they reach the meso in is the order they are imported into the first round of the breed race. The norns that do not pass the qualifying round, that fail to reach the meso before dying, are clearly not eligible to compete. So with the qualified norns exported round 1 can begin. The norns are imported and then transferred to the workshop in the order they completed the qualifying round. This order could make all the difference as only the first ten norns to the meso qualify for round 2. Once the ten qualifiers have been selected and their positions recorded round 2 will take place. I’ve decided that the second round of the competition will have toys in the hub in order to distract the norns from their race for survival. More updates on round 2 to come. After my first post I felt a little cold about the lack of reward for the winning survivor of this marathon and got to thinking about a solution. I’m toying with the idea of creating a new skin (I’ve never tried but why not I guess). My plan is to either change the genetics of the winning creature so that it has the new skin. If that results in disaster I will give it to their unborn offspring. This will be the birth of a new breed in my opinion. The birth of the greyhound breed! Although it might take several generations before thay live up to their title: The fastest of all the norns, and therefore the best for competing in capillata races. That leads me to my next long term plan. Norn racing! I will begin work on an obstacle course metaroom that will test a norn’s speed, survival instincts and bravado. I'm thinking of using my scenenary making skills from warhammer to create a model of the room in try creatures 1 fashion.